Area of km2. 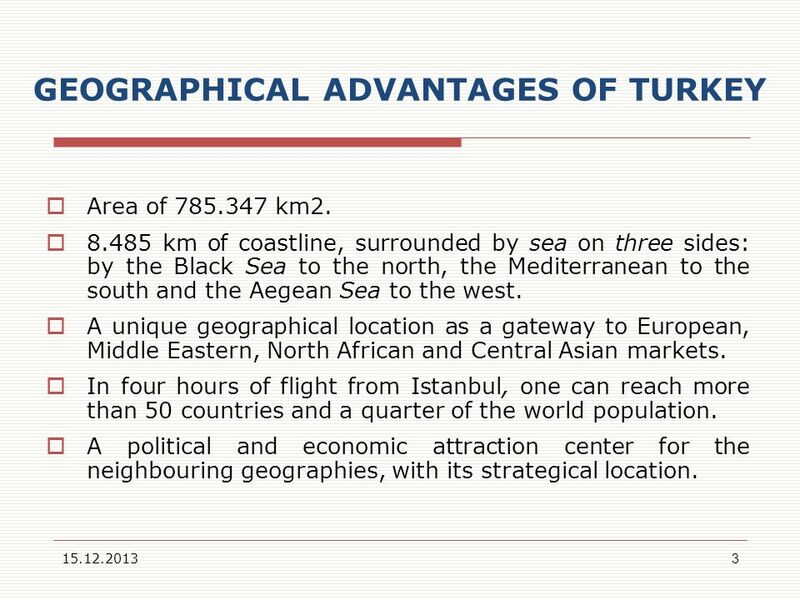 8.485 km of coastline, surrounded by sea on three sides: by the Black Sea to the north, the Mediterranean to the south and the Aegean Sea to the west. A unique geographical location as a gateway to European, Middle Eastern, North African and Central Asian markets. In four hours of flight from Istanbul, one can reach more than 50 countries and a quarter of the world population. A political and economic attraction center for the neighbouring geographies, with its strategical location. 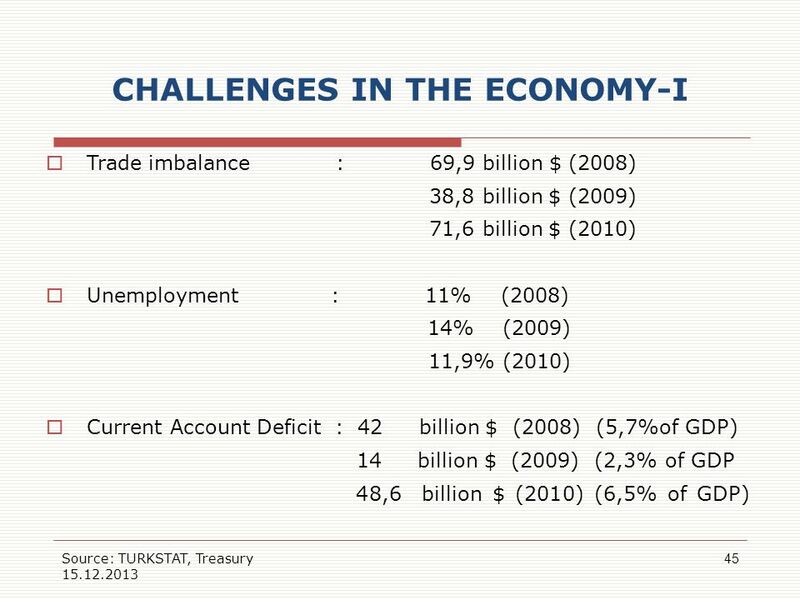 7 TURKEY AND G-20 Turkey is a G-20 member, the “Super League” of world economies, established in 1999. 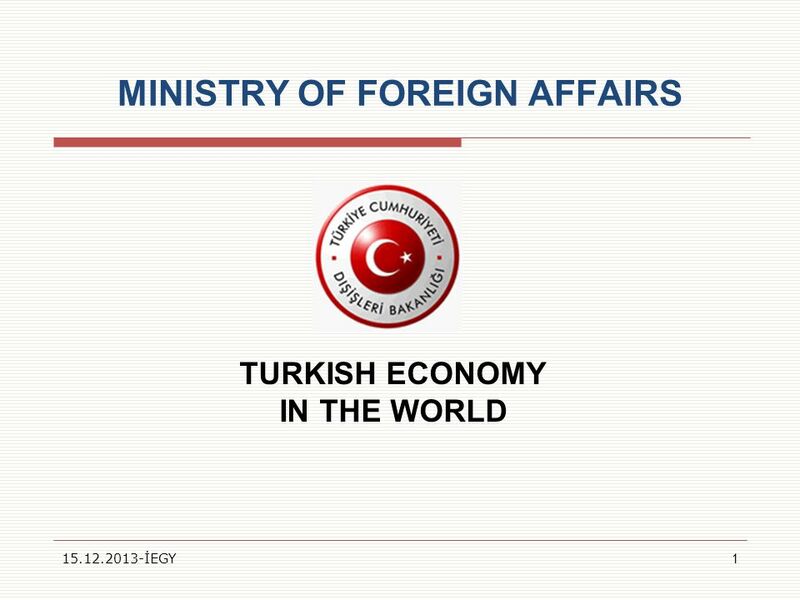 This membership gives Turkey the opportunity to express its views and suggestions for the solution of international economic and financial problems and strengthens its profile. It is an important platform for sharing views on global economy with the other leading actors. As a by-product of our pro-active foreign policy, we are not solely focusing on our agenda, but also trying to reflect the views of other actors not represented in G-20. Turkey ranks 16th in the world production of motor vehicles. Turkey is the leading bus manufacturer and 3rd largest commercial vehicle manufacturer in Europe. Around 75% of the automative and auto parts industry exports are delivered to the EU countries. 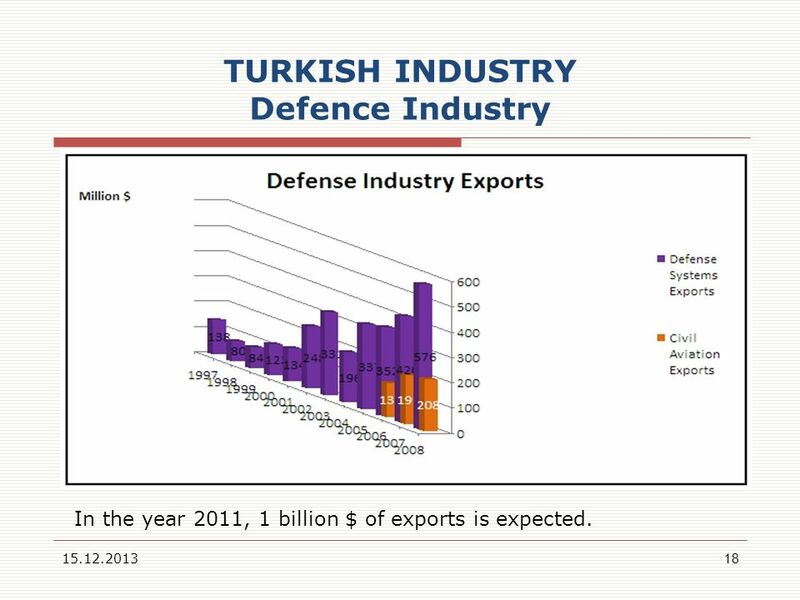 During the last 4 years, ship-building capacity of Turkey has grown 3 times. 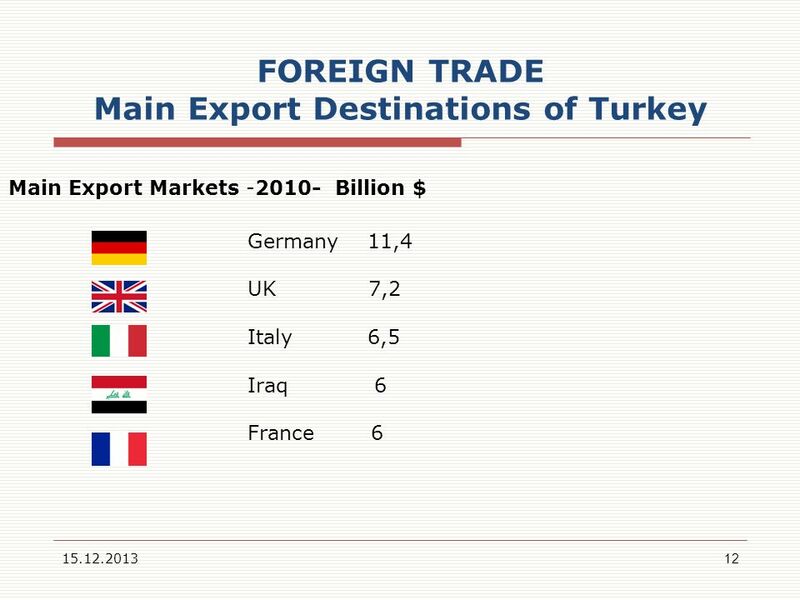 Turkey ranks 7th in world ship exports. 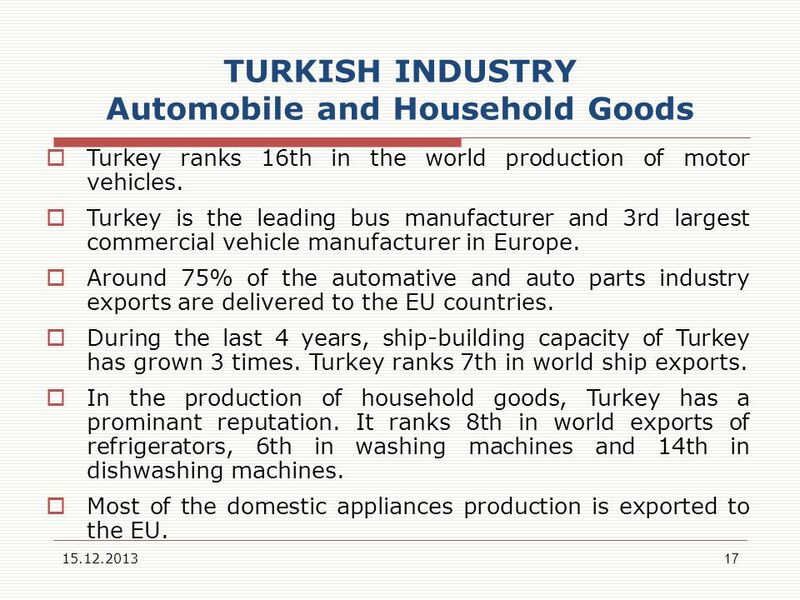 In the production of household goods, Turkey has a prominant reputation. It ranks 8th in world exports of refrigerators, 6th in washing machines and 14th in dishwashing machines. Most of the domestic appliances production is exported to the EU. 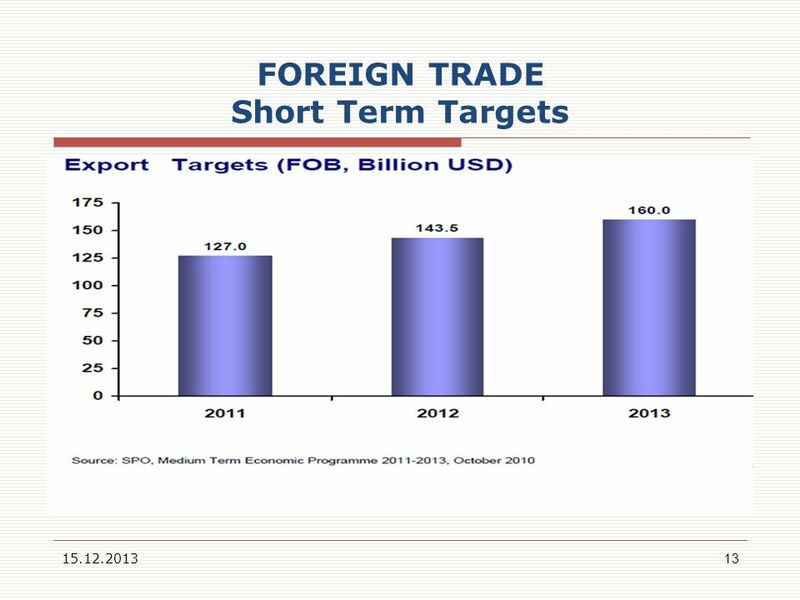 In the year 2011, 1 billion $ of exports is expected. Turkey ranks 7th in the world cotton production. There are more than 35 thousand textile and clothing companies in Turkey. 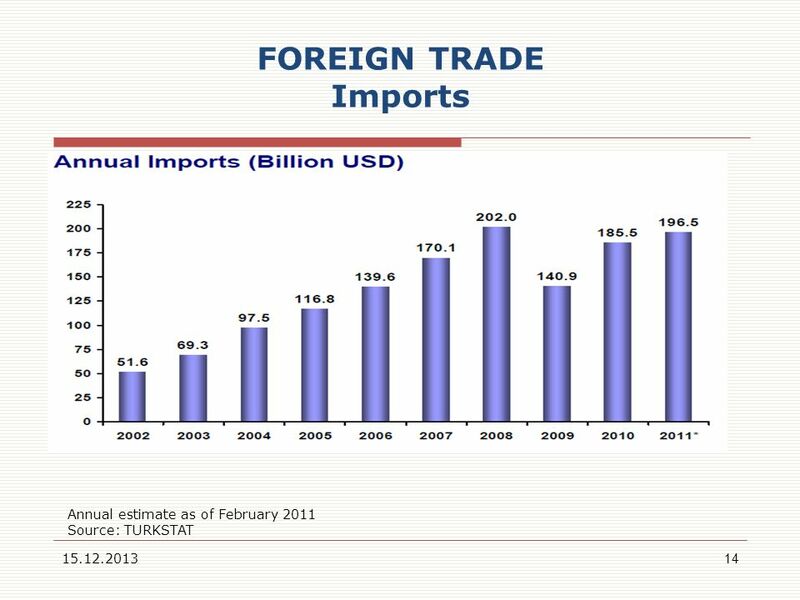 Turkey ranks 4th in knitted clothing, 8th in woven clothing, 3rd in socks and stockings and 8th in leather wear exports. 80% of the textile products are exported to the EU countries. 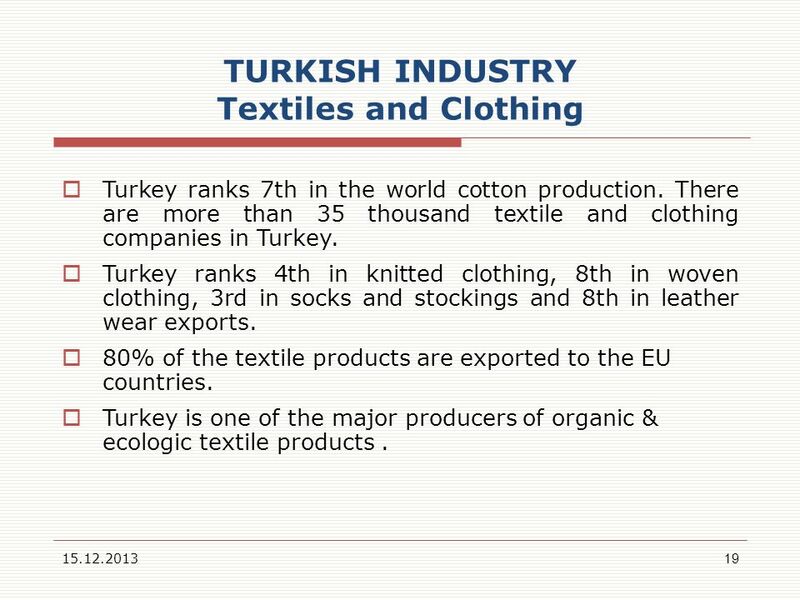 Turkey is one of the major producers of organic & ecologic textile products . 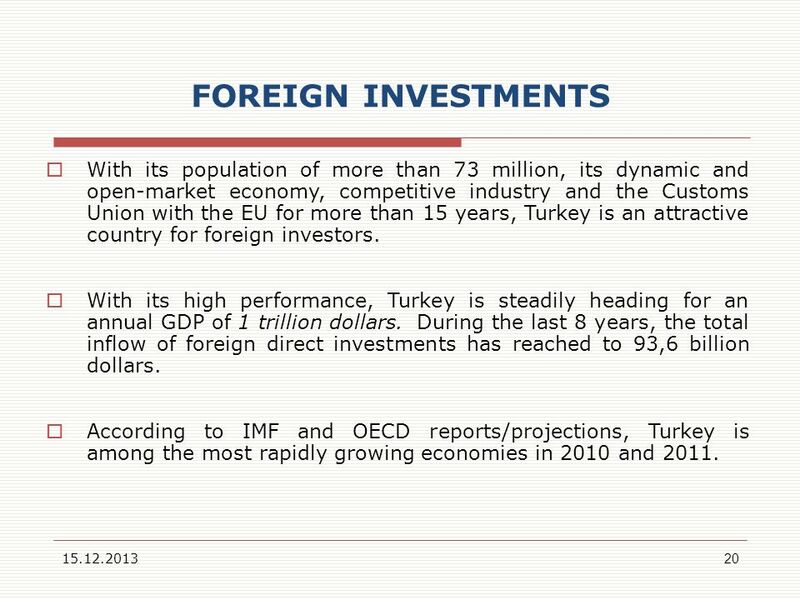 20 FOREIGN INVESTMENTS With its population of more than 73 million, its dynamic and open-market economy, competitive industry and the Customs Union with the EU for more than 15 years, Turkey is an attractive country for foreign investors. 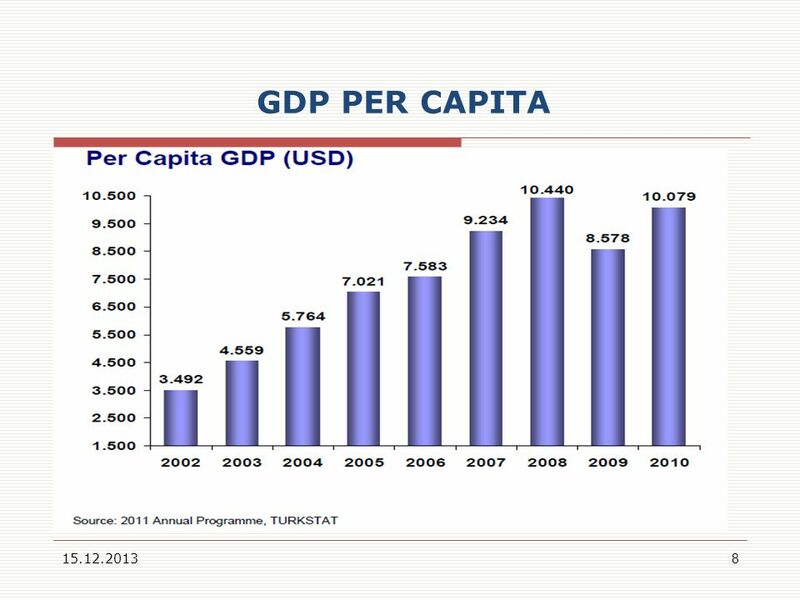 With its high performance, Turkey is steadily heading for an annual GDP of 1 trillion dollars. 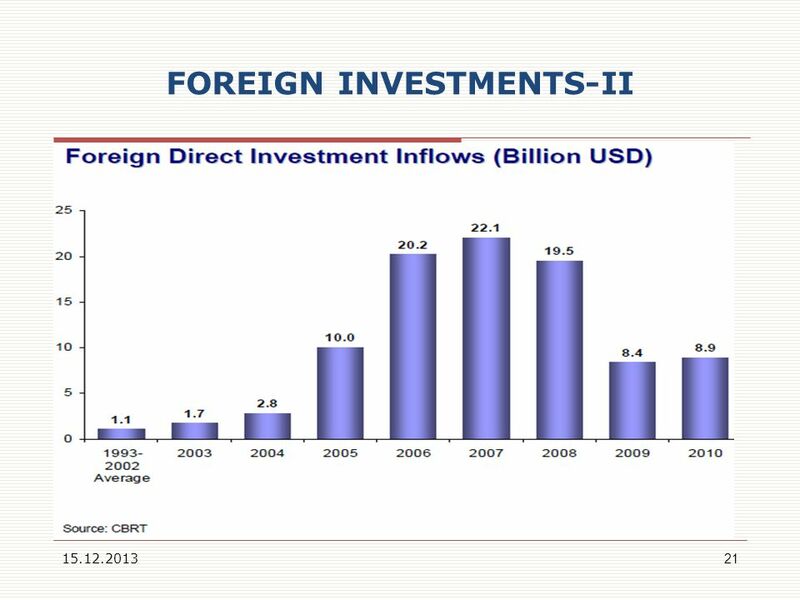 During the last 8 years, the total inflow of foreign direct investments has reached to 93,6 billion dollars. 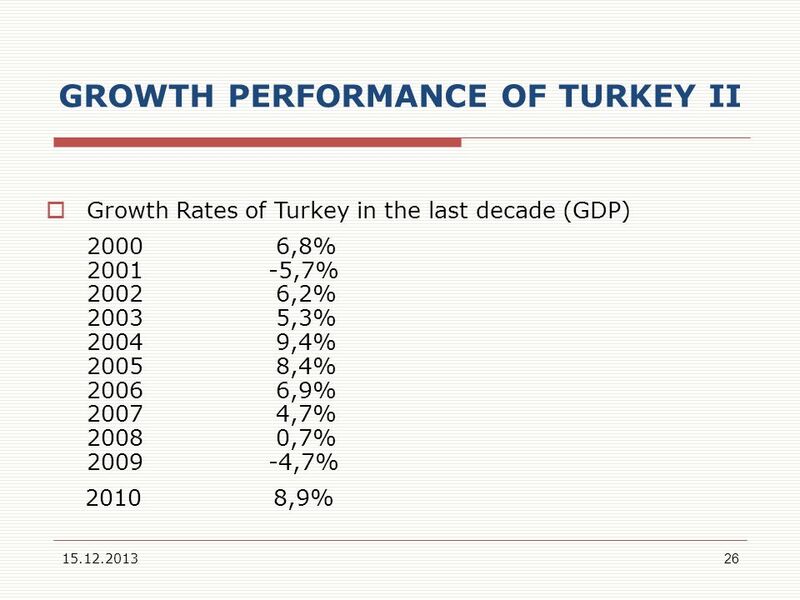 According to IMF and OECD reports/projections, Turkey is among the most rapidly growing economies in 2010 and 2011. 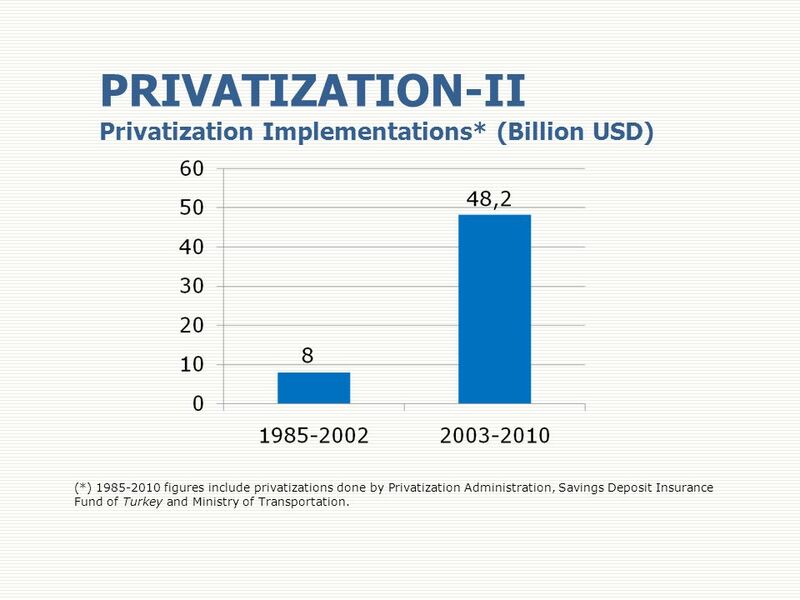 23 PRIVATIZATION Privatization has been among the top priorities on the agenda in line with Turkey’s target of creating a truly competitive market economy. The involvement and participation of international investors is highly encouraged in the massive privatization program. The main philosophy of privatization is to confine the role of the state to areas such as health, basic education, social security, national defense and large scale infrastructure investments. 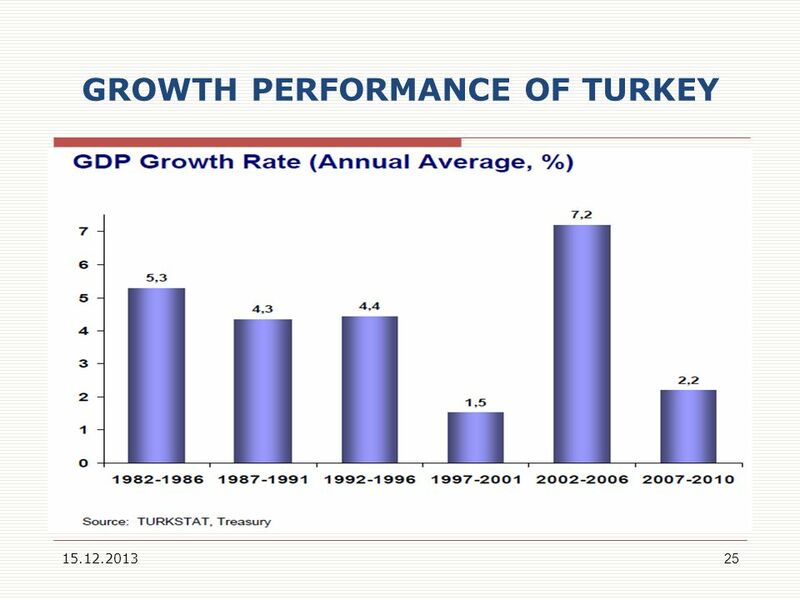 Turkey is listed among the top 25 OECD countries that has gained the most out of its privatization program. 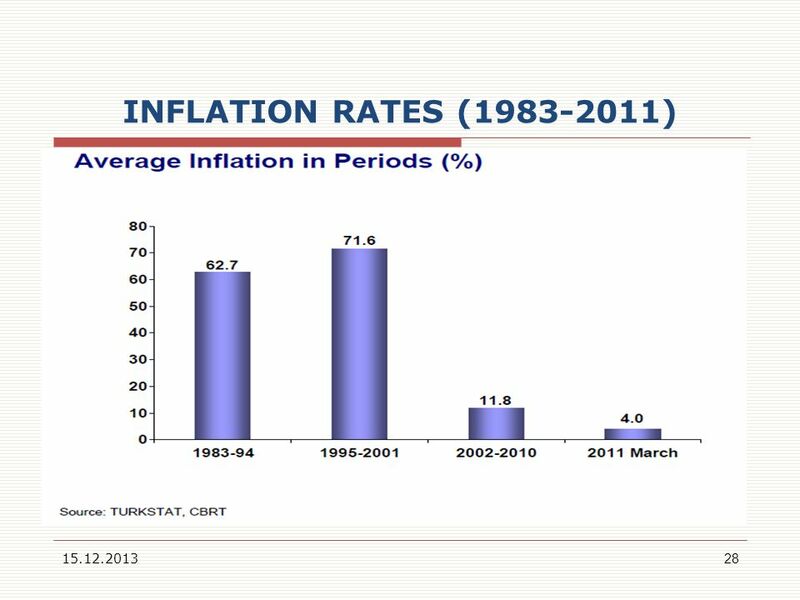 (*) figures include privatizations done by Privatization Administration, Savings Deposit Insurance Fund of Turkey and Ministry of Transportation. 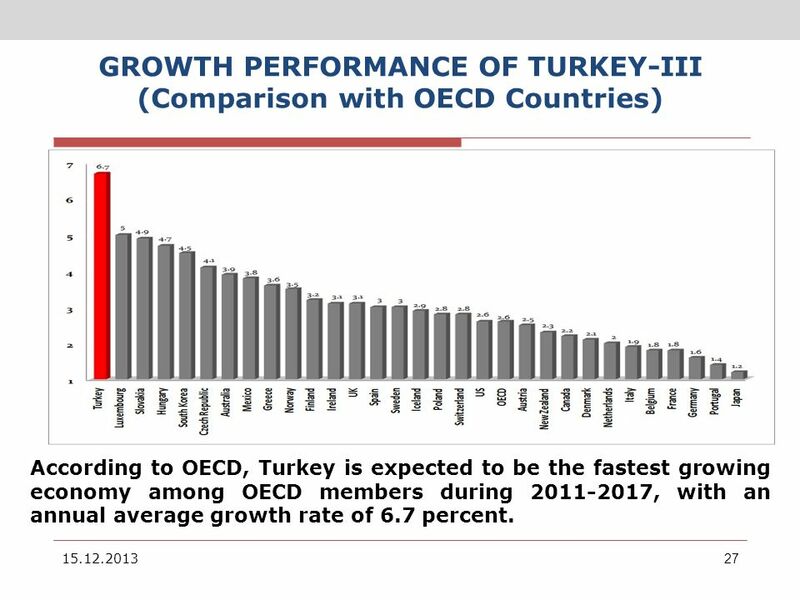 Annual Average Real GDP Growth (%) Forecast in OECD Countries Dönemi OECD Ülkeleri Yıllık Ortalama Reel GSYİH Büyüme Tahminleri (%) GROWTH PERFORMANCE OF TURKEY-III (Comparison with OECD Countries) According to OECD, Turkey is expected to be the fastest growing economy among OECD members during , with an annual average growth rate of 6.7 percent. 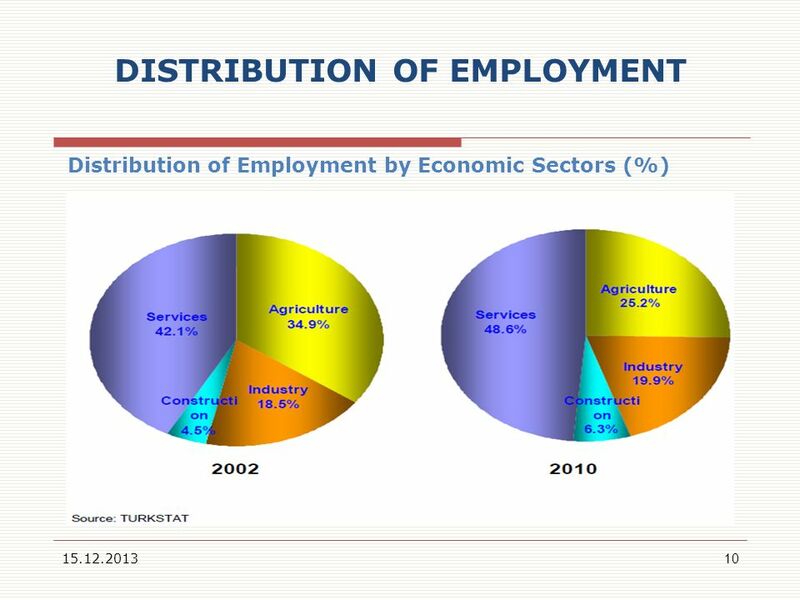 Turkey is the leading country in its region in the construction sector. It is the main manufacturer of cement in Europe. 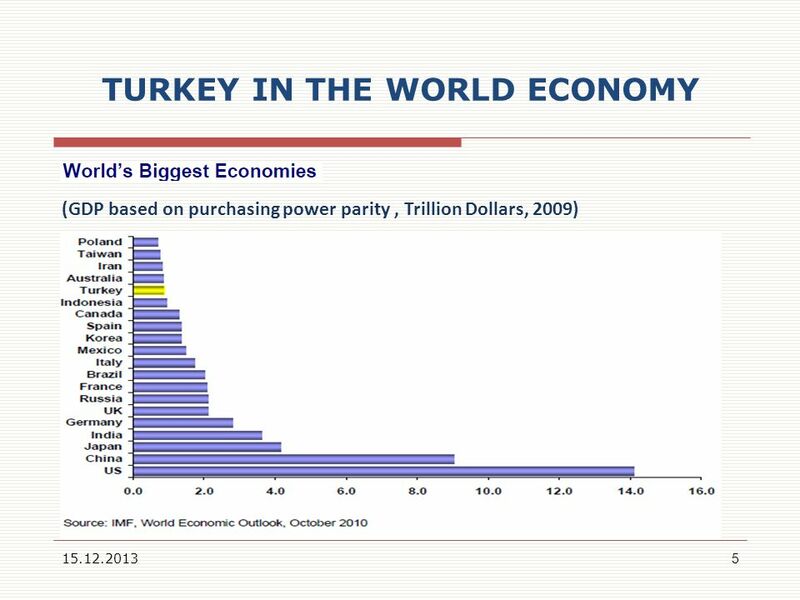 Among cement manufacturers in the world, Turkey ranks 4th. Turkey also ranks 10th in steel production. 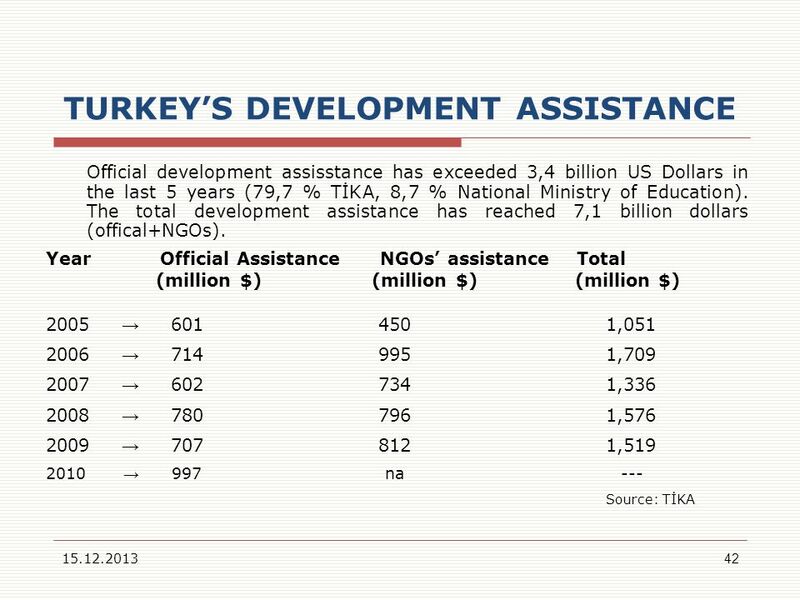 As of the end of 2010, Turkish construction sector has attained 188 billion dollars worth of contracts in 89 countries, from Balkans to Central Asia, from Russia to the Middle East and Africa. 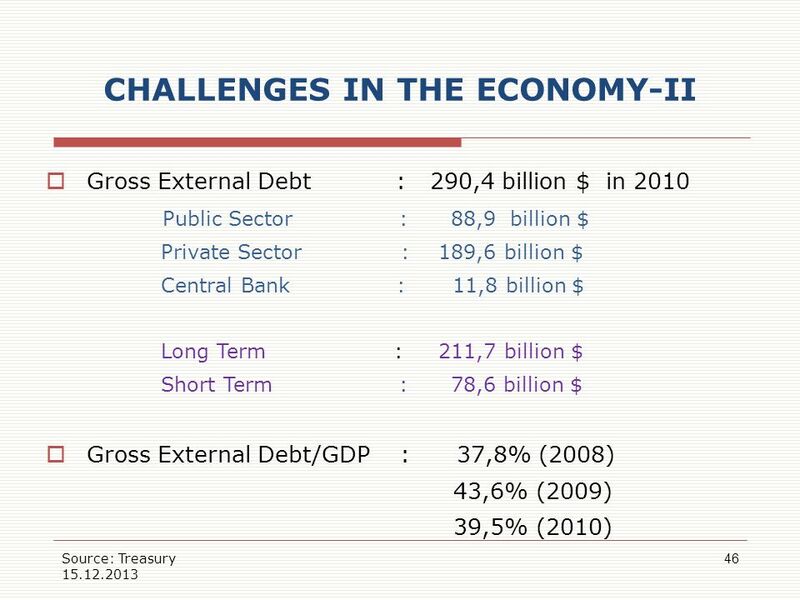 On an annual basis it has an average business capacity of 20 billion $ (The target for 2011 is 30 billion$, for billion $). According to the “Top 225 International Contractors" list of Engineering News Record magazine, Turkey is the second country in the world with 33 outstanding firms (2010). 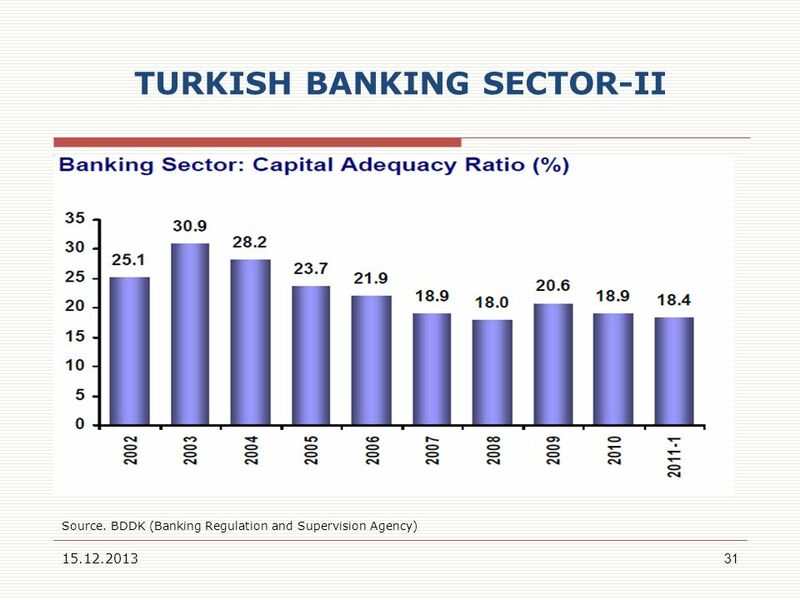 Turkey has already completed deep-rooted reforms in the banking sector as of Thanks to these reforms, the banks in Turkey have not suffered from the global crisis; on the contrary they have increased their profits. Turkish banks have branches and offices in 14 countries (USA, Germany, Bahrain, Bulgaria, China, Georgia, Iraq, UK, TRNC, Luxemburg, Malta, Pakistan, Russia, Greece). There are 41 representations of foreign banks in Turkey (Switzerland 8, Germany 6, the Netherlands 6, USA 4, France 3, UK 4, Spain 2, Italy 2, Qatar, UAE, Belgium, India, Canada, Japan 1). 32 TOURISM One of the top 10 tourism destinations across the globe. 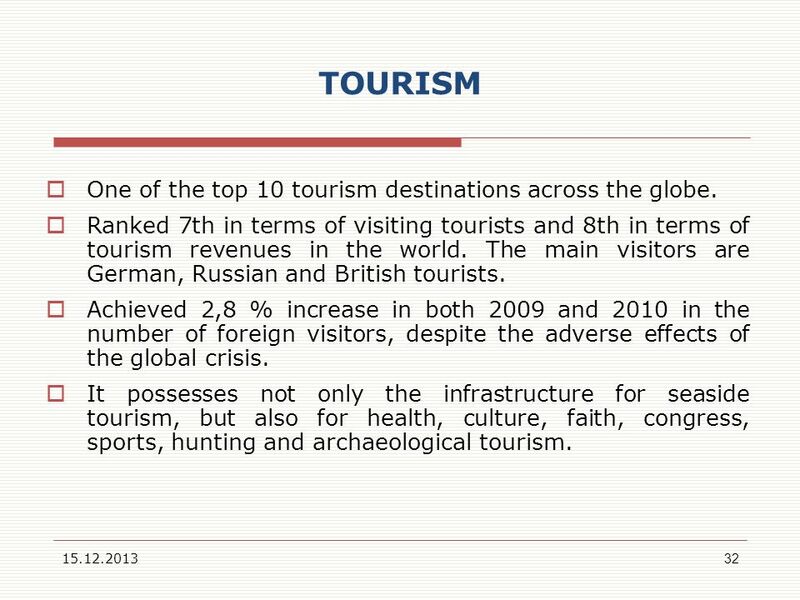 Ranked 7th in terms of visiting tourists and 8th in terms of tourism revenues in the world. The main visitors are German, Russian and British tourists. 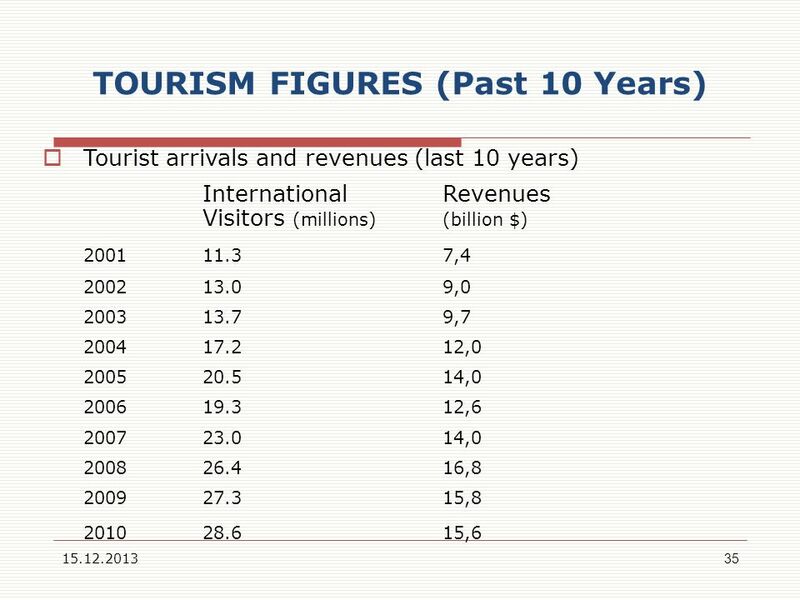 Achieved 2,8 % increase in both 2009 and 2010 in the number of foreign visitors, despite the adverse effects of the global crisis. It possesses not only the infrastructure for seaside tourism, but also for health, culture, faith, congress, sports, hunting and archaeological tourism. 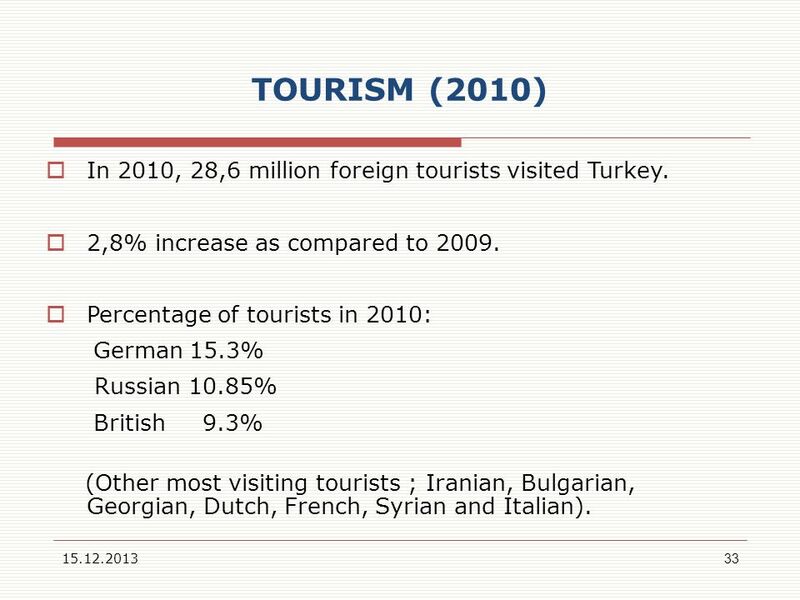 33 TOURISM (2010) In 2010, 28,6 million foreign tourists visited Turkey. 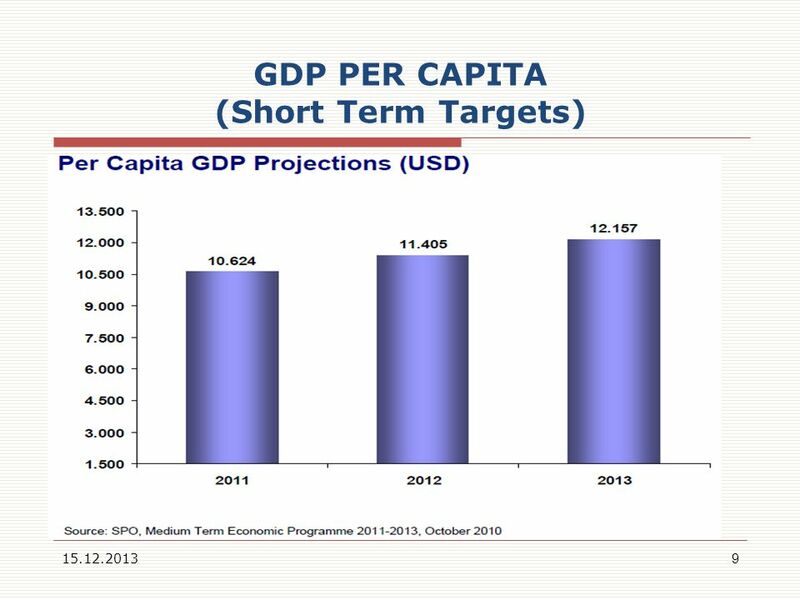 2,8% increase as compared to 2009. Percentage of tourists in 2010: German 15.3% Russian 10.85% British % (Other most visiting tourists ; Iranian, Bulgarian, Georgian, Dutch, French, Syrian and Italian). 34 HEALTH TOURISM Receiving nearly 60 thousand visitors for health tourism, generating an approximate annual income of 1 billion $. 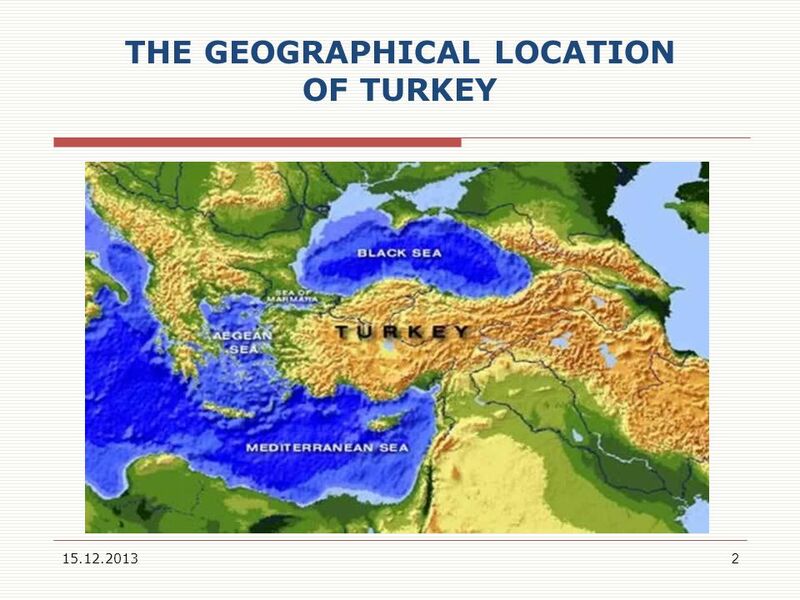 Turkey is the 1st in Europe and 7th in the world in terms of thermal sources. Modern and very competitive private health centers. Low costs in health services. Qualified and experienced staff in the health sector. 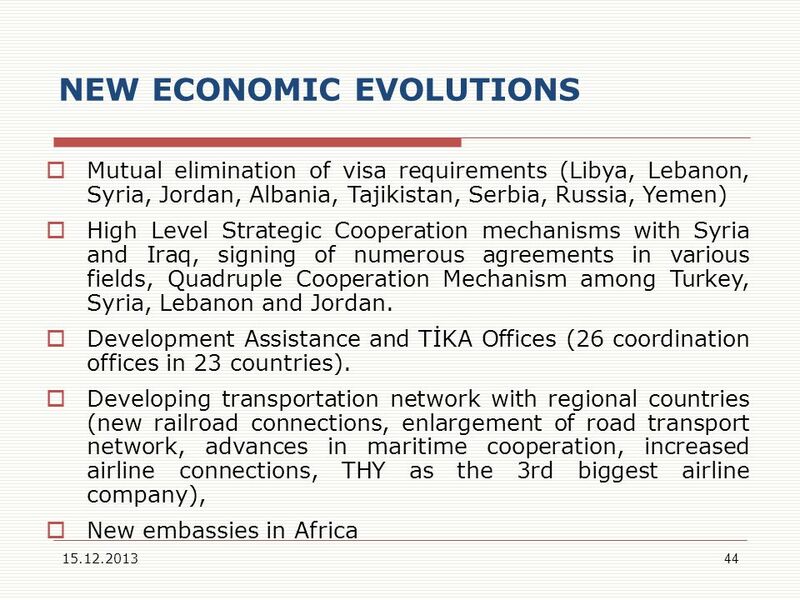 36 TRANSPORTATION Turkey has a unique and strategic location as part of both Europe and Asia. km of two-lane highways. The target is to increase it to 22,500 km by the end of 2011. 12 new motorway projects to be built by the year 2023, the total length of which will be 4,773 kilometers. 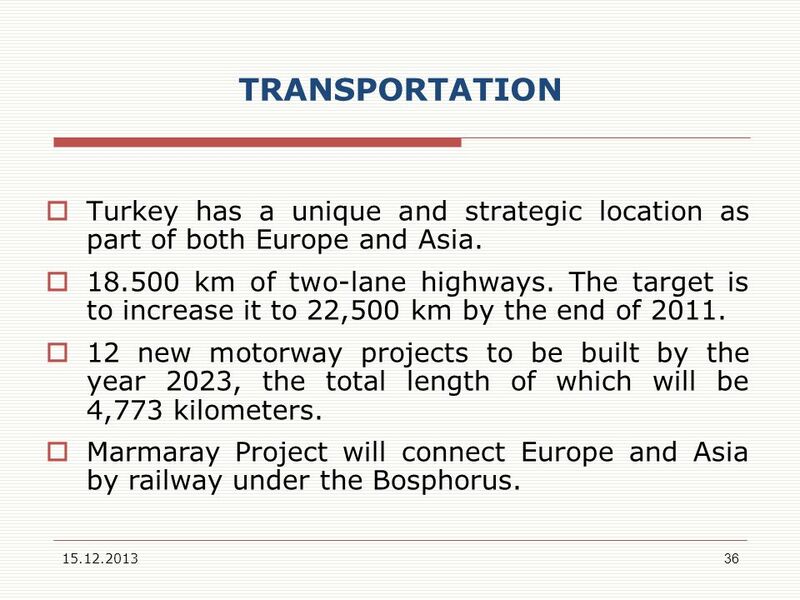 Marmaray Project will connect Europe and Asia by railway under the Bosphorus. 37 TURKISH AIRLINES Fastest growing airline company in Europe. 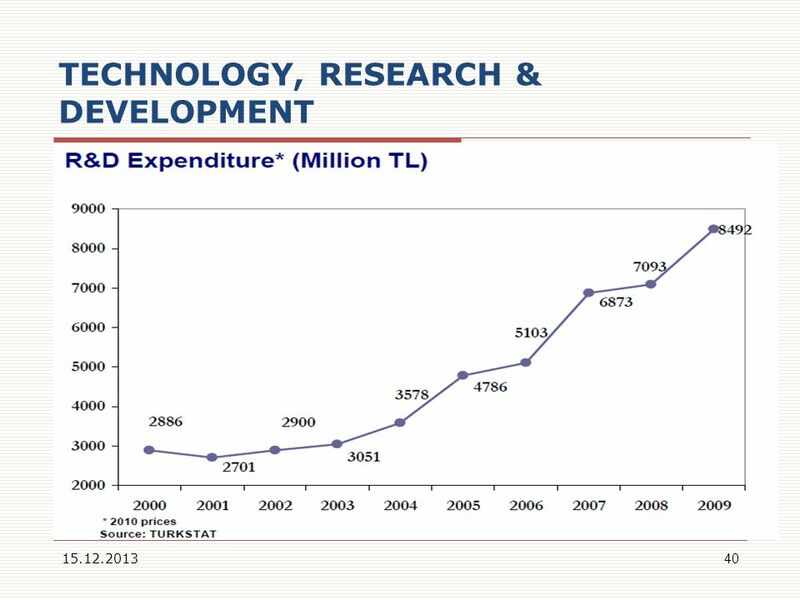 Turkey’s R&D expenditures rose to 0.85% of GDP in The target is 2%. The number of “technoparks” reached 39 in firms are active in these parks, the added value of which amounts to 540 million $ in Turkish exports. Between 2003 and 2009, domestic intellectual property right applications and licensing increased five-fold. Utmost importance attached to investments in information and communication technologies. A growing market of 30 billion US Dollars, constituting 4 % of GDP Turkish “software” market recorded a growth rate of % 100 in recent years and reached the level of 2 billion US Dollars as of 2009. Over 68 million mobile phone subscriptions, 37 million wideband Internet users. Well educated engineers and specialised personnel in technology and IT fields. 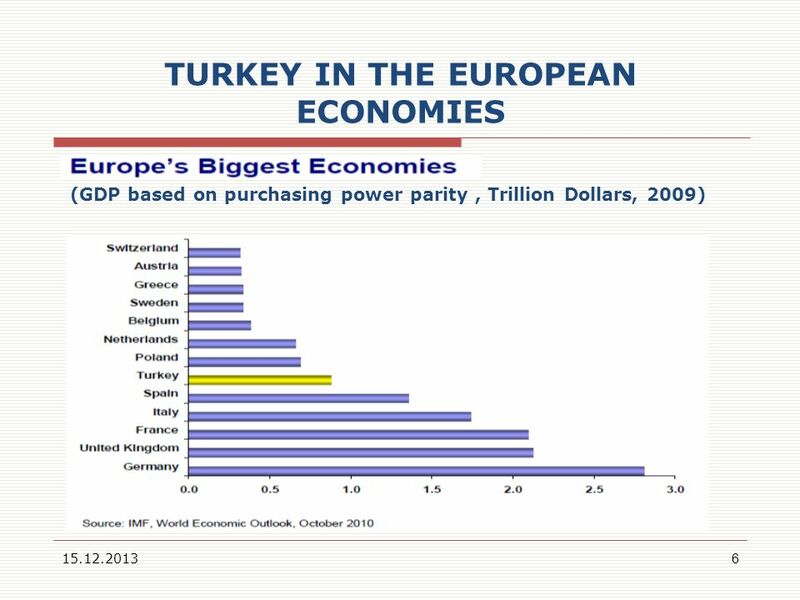 41 AGRICULTURE Turkey is the 8th biggest power in terms of agricultural production (Annual produce value of up to billion $). One of the most important producer and exporter countries of the region. Produces more than 150 agricultural products. The total amount of fruits and vegetables produced is 42 million tonnes. 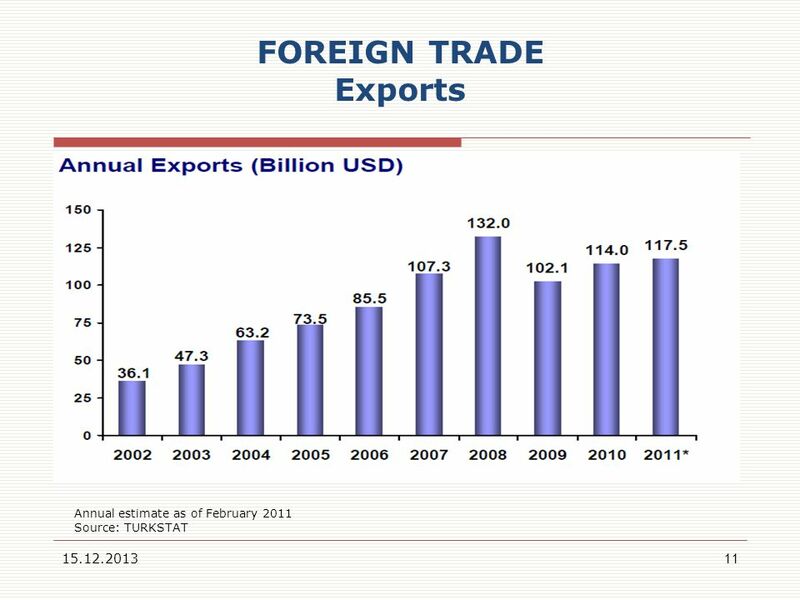 Exports to 177 countries. Thanks to her diverse geography & climate; Turkey is: - ♯1 in terms of hazelnut, fig, quince, cherry, fresh and dried apricot production, - ♯3 in terms of pistachio production, - ♯5 in terms of tea and olive oil production in the world. 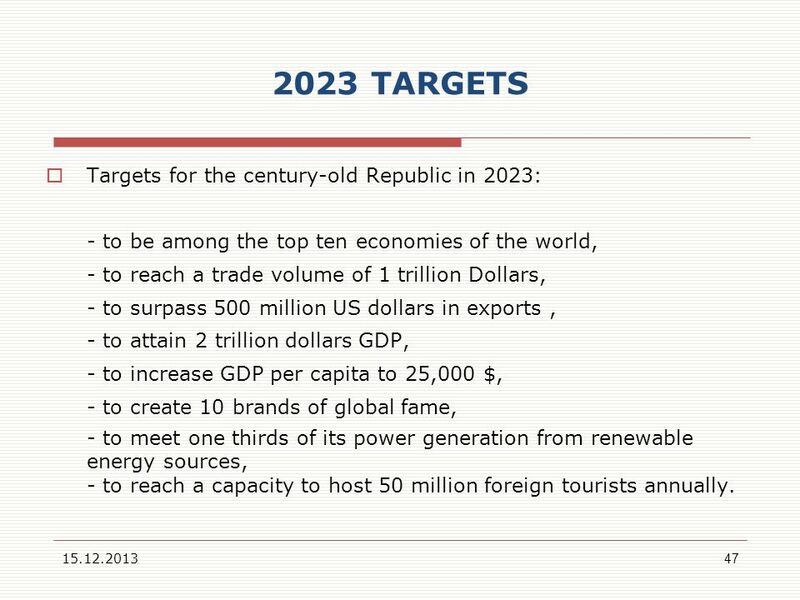 - to be among the top ten economies of the world, - to reach a trade volume of 1 trillion Dollars, - to surpass 500 million US dollars in exports , - to attain 2 trillion dollars GDP, - to increase GDP per capita to 25,000 $, - to create 10 brands of global fame, - to meet one thirds of its power generation from renewable energy sources, - to reach a capacity to host 50 million foreign tourists annually. 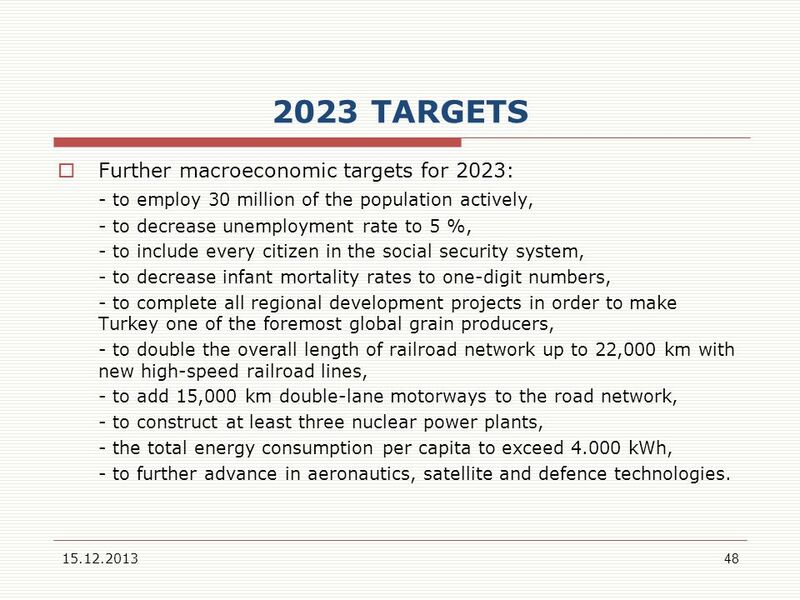 - to employ 30 million of the population actively, - to decrease unemployment rate to 5 %, - to include every citizen in the social security system, - to decrease infant mortality rates to one-digit numbers, - to complete all regional development projects in order to make Turkey one of the foremost global grain producers, - to double the overall length of railroad network up to 22,000 km with new high-speed railroad lines, - to add 15,000 km double-lane motorways to the road network, - to construct at least three nuclear power plants, - the total energy consumption per capita to exceed kWh, - to further advance in aeronautics, satellite and defence technologies. 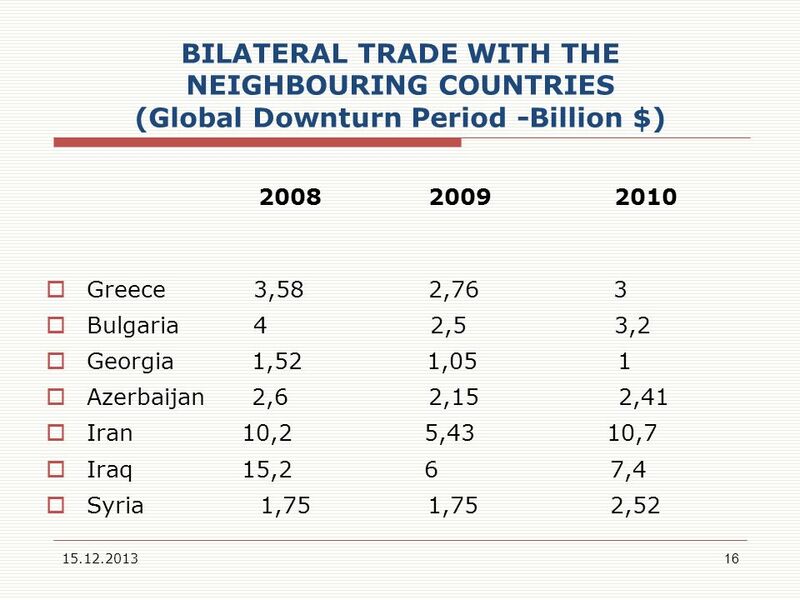 Download ppt "MINISTRY OF FOREIGN AFFAIRS"
Evidence on Interlinkages REMITTANCES Size Albania: $778 million annually (IMF,2005). 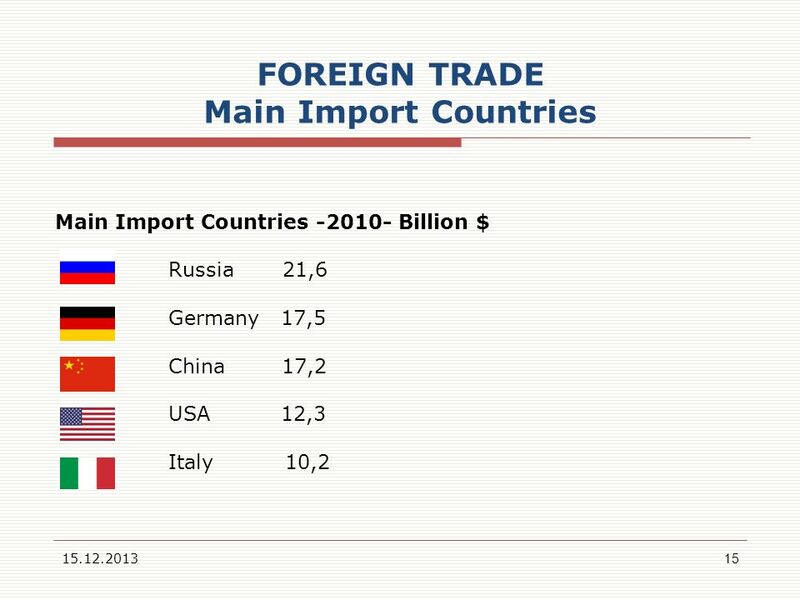 Equal twice the proceeds from exports, 1/3 of GDP. The savings of.